Yes, the trees are up an decorated at the house. One in the sunroom, and one in the living room. They are my artificials this year and I can say, I think since it doesn't SMELL like christmas, is why we aren't quite in the Christmas spirit. Someone said they needed snow... Christmas to me is more the "pine smell", then the messy snow. OH well. Here is a tree decorated for the holidays, alittle more traditional then my own at home, but I when I mentioned trees to my daughter, she jumped at the chance to help - and I think she did a great job! Thank you Colette for your trees. You did great! Garden Green CS was crimped and scalloped at the lowest point. Chocolate Chip rectangle for the base of the tree. Boho blossoms in yellow for the 'star'. 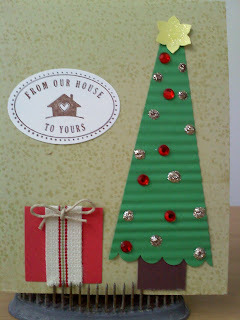 Gold Glitter and Red Rhinestones made up the ornaments on the tree. 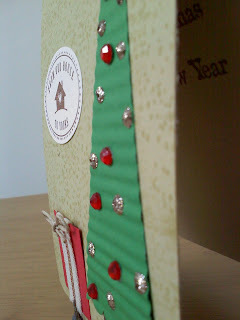 The card base is Sahara, with versamark snowflakes. The Whisper White Wide Oval with the stamped verse finishes off the card.